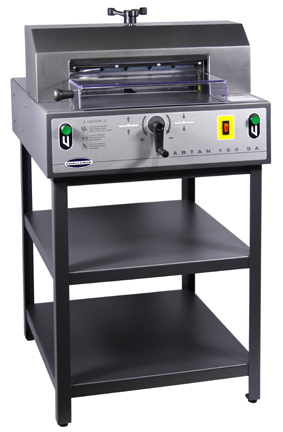 The SPARTAN 150 SA Paper Cutter is a sleek, strong, 15″ table-top machine perfect for the professional office, copy center, in-plant, and on-demand printing environment. Holding true to our tradition, the Spartan 150 SA is engineered and manufactured to the highest of safety standards available in the world. Safety shields cover the front and rear tables. The front-side cut buttons require two hands to simultaneously activate the cut cycle. The easy to read digital display located on the front table of the machine allows the operator to easily set the backgauge position accurately…everytime. Twelve red LED lights positioned over the knife provides the brightest, most consistent and easy to see optical cut-line in the industry. Front shield automatically pops open after a cut cycle is completed allowing the operator to remove the cut stock without the extra step of having to manually open the cover. “Gibs” are devices used to control the knife position during a cut cycle assuring a consistent and accurate cut. Traditionally, these surfaces require routine lubrication because of the continuous surface friction they have with the moving knife bar. The Spartan 150 SA gibs however, are made of an advanced material called UHMW that is both strong and self-lubricating – resulting in virtually maintenance free durability.